We’re getting there – we’ve nearly waded through all our outstanding photographs from both our recent French trip and from the wedding we attended a week after returning. At least now the photographs are not on real film, I didn’t have to sit scanning hundreds of pictures in. This year’s trip to France was not great as regards weather but, in my opinion at least, the wildlife helped to make up for it. We didn’t see some of the birds we would normally expect to see at springtime (bee-eaters, golden orioles) but I did manage to add substantially to the contents of my insect catalogues. I’ve always been captivated by butterflies. Even as a child I collected Brooke Bond PG Tips cards and my favourite collection was the butterflies. As a child in Watford, though, I never seemed to see anything exotic myself; the cards and books were my only contact with much other than the ubiquitous Large White (a.k.a. Cabbage White). As a result, having begun regular pilgrimages to France, my eyes couldn’t help but be drawn to colourful butterflies that I’d never before seen. I was quite likely to slam the brakes on (having checked the rear-view mirror, of course), leap from the car and chase headlong across a field after a fluttering beauty. 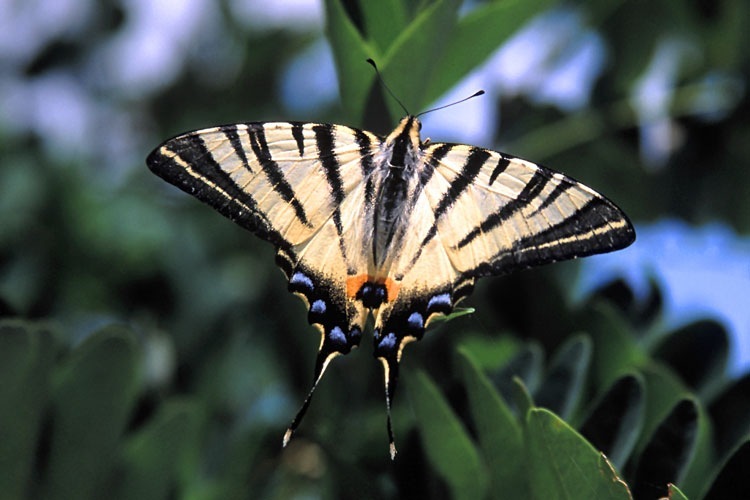 Most captivating of all was undoubtedly the so-called Scarce Swallowtail. It really is a strikingly beautiful creature. It is also one of the more cooperative butterflies in that it sits with its wings open at rest. The picture (right) is from the days of real film (50 ASA Fuji Velvia). 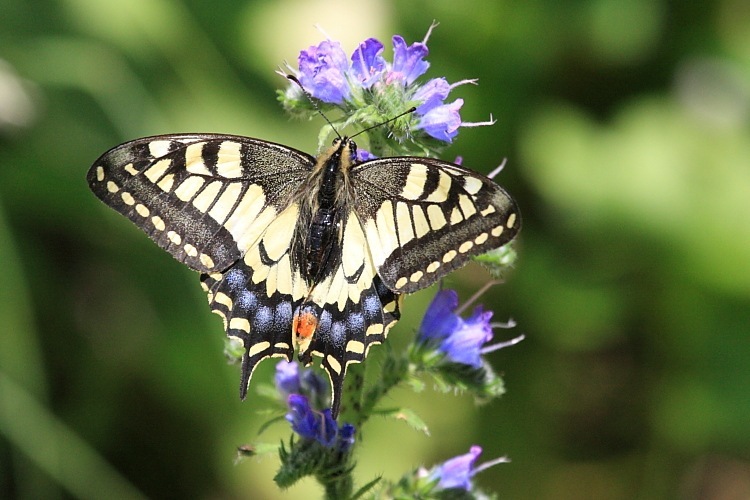 The Scarce Swallowtail doesn’t visit our shores but, it seemed to me, one didn’t have to go far south in France before the strangely named Scarce Swallowtail became relatively common. Not a French trip went by without my seeing at least one. There is a (regular) Swallowtail which is, apparently, a rare visitor to Britain but I had never knowingly seen one anywhere. Had I suspected that one was about, I would undoubtedly have checked the rear-view mirror, slammed on the anchors and leapt out excitedly. At least, that was the case until this year. This year, not only did I not see any Scarce Swallowtails but I finally saw and captured (photographically, that is) a couple of (regular) Swallowtails. The first was flitting about frenetically on a plateau at about 1400m in the Pyrenees. The second was hungrily feeding in the Gorge de la Frau. Well, if you’re going to flit about frenetically, you have to feed well, I suppose. This time captured digitally (800 ASA pixels), here is what I consider to be my best shot. 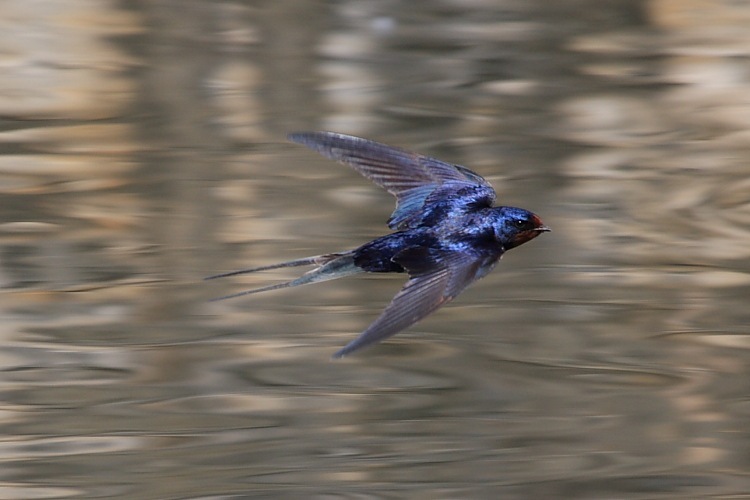 Finally, and just because I was lucky enough to snag a Swallow in flight on this year’s trip, here is the bird after which both these fabulous creatures are named. The Scarce Swallowtail has longer “streamers”, more like the bird but, in a beauty contest, it would be hard to pick a winner, wouldn’t it?